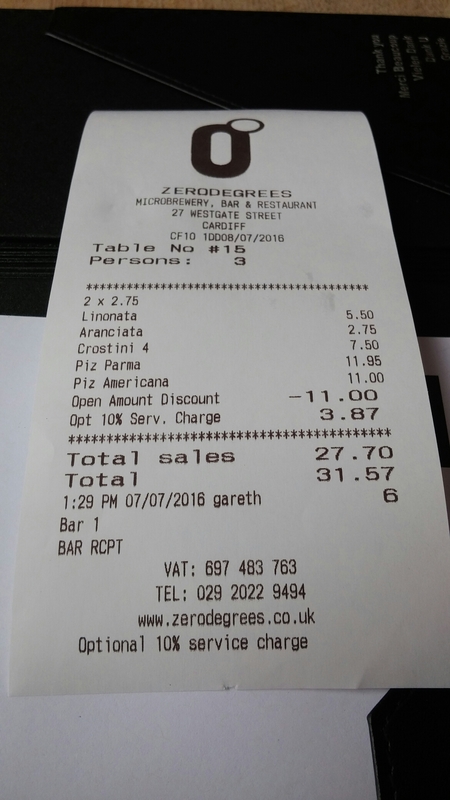 The “buy one get one free degrees” lunch offer at Zero Degrees, Cardiff. Not many people under the age of say 40 will get the (not very good) joke in the title. For the young-uns, it refers to the US trio, the Three Degrees (apparently there were 15 Three Degrees in all, but never more than 3 at a time for obvious reasons – the Sugerbabes of their day if you would) and the fact that Zero Degrees in Cardiff does a week day “buy one get one free” (BOGOF) on its food offering. 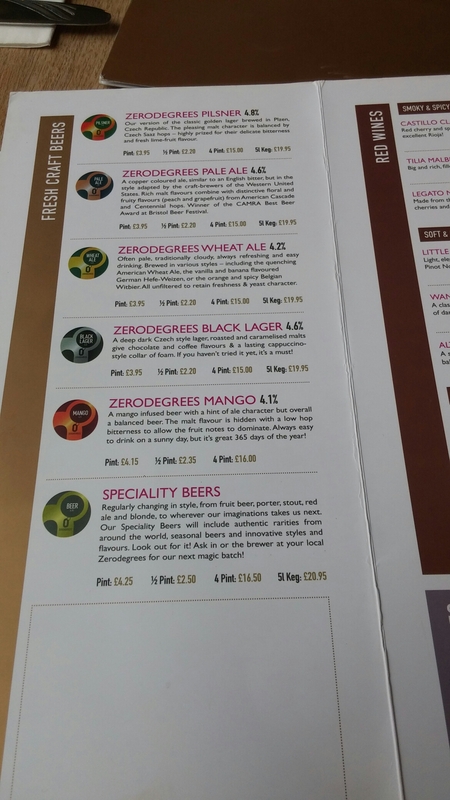 Zero Degrees has been around for a while and I have been there a few times, but only for booze rather than food. My eyes (when in there) have, however, always been drawn to the large wood burning pizza oven that dominates the left hand side of the place, making me wonder what the food was like. Seeing the offer and always one for a bargain, the chaps from work and I (sans one who was on hols – which buggered up the BOGOF a bit) decided to give it a go. 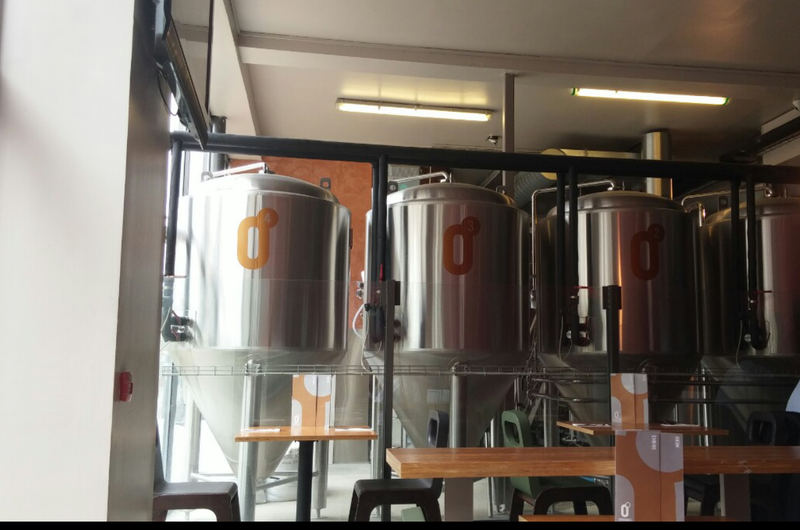 This was after a brief look inside the Brewhouse and a very rapid retreat from the same as we stuck to everything (floor,tables, chairs). Inside it is a big old unit and despite the beer tanks and wood burning pizza oven it’s all a bit soulless to my mind. I suspect in the evening when it is full it is a different matter but on our day time visit, even with a fair few tables occupied,it felt strangely empty. Rumour has it that when they opened the planning permission neglected to allow for on-site brewing and thus the tanks were merely for show. 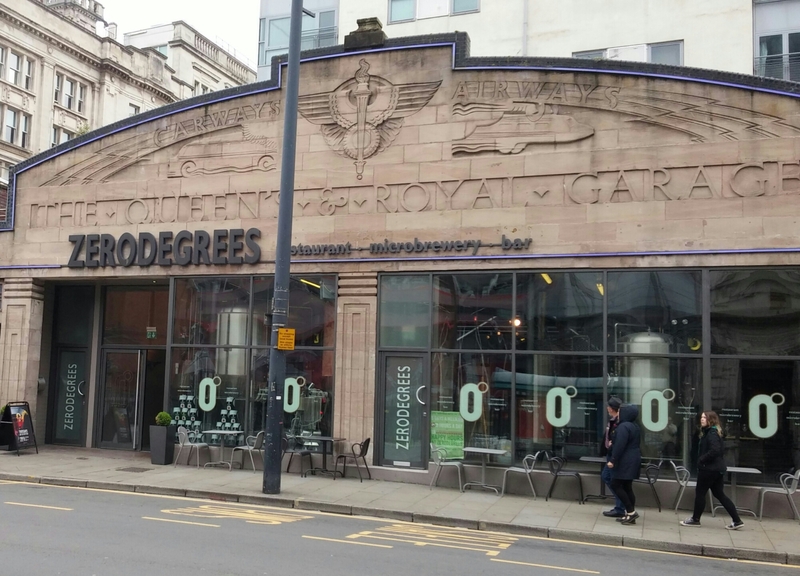 If this is true, it certainly seems to be no longer the case as one was being cleaned out when we were there and it had definitely had something beery in it judging from the smell. The menu is a bit of a mish mash. Whilst the focus is clearly on Italian food (antipasta, pizza, pasta and rissotos), it really bounces around the world with dishes with nods in the direction of Southern US (Cajun and BBQ), Caribbean, Mexican, North Africa, the Middle East and the Far East. We decided on 2 pizzas to share (based on the BOGOF) and a portion of the crostini to kick off proceedings and supplement the shared pizzas. 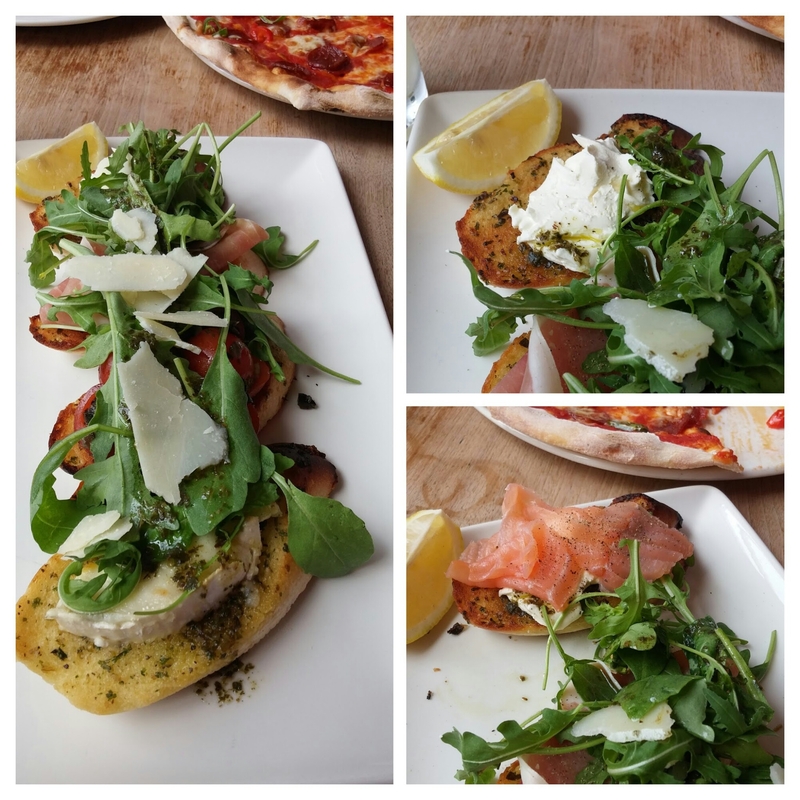 The crostini (£7.50 for 4 quite chunky pieces) were topped generously with goat’s cheese, Parma ham, mascarpone and smoked salmon. In the latter case initially there was none of the advertised smoked salmon, but on mentioning its absent the dish was taken away and its omission rapidly rectified. On top of all this was rocket (bit too much – they do seem to be overly fond of rocket in the kitchen here) and shavings of parmesan. All in all not bad and it was a generous portion. In hindsight, we probably didn’t need it as the pizzas we ordered were on the large size even when shared 2 between 3 people and if we had an iota of common sense between us would have ordered two smaller and cheaper appetisers to take full advantage of the BOGOF. Next up were pizzas. 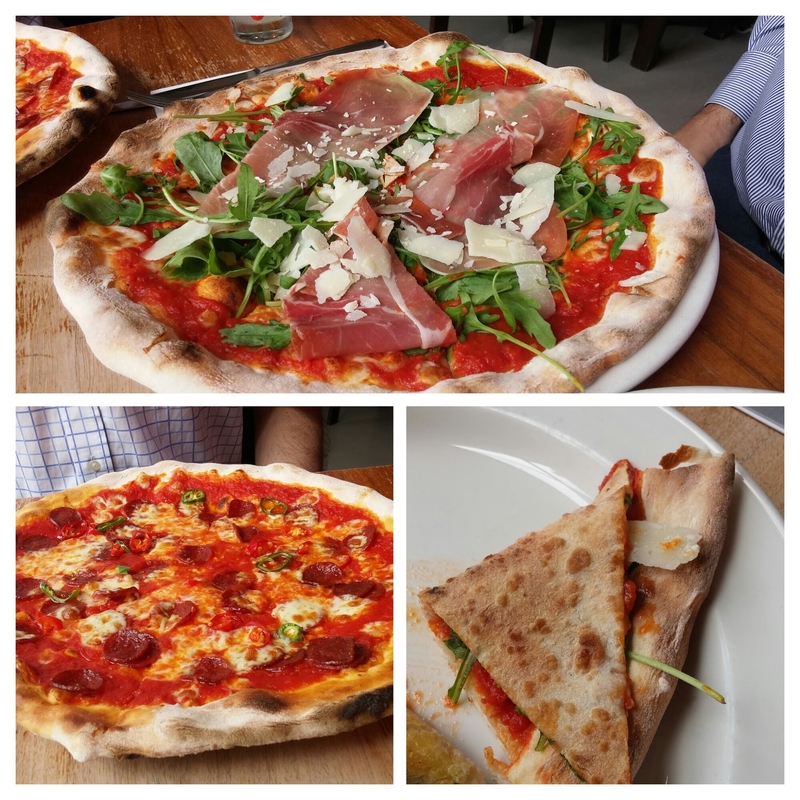 I tend to prefer a classic pizza so our order consisted of two of the more simple ones on the menu, an Americana (pepperoni and chillies on a tomato sauce – £11) and a Parma (Parma ham, rocket, parmesan and tomato sauce). 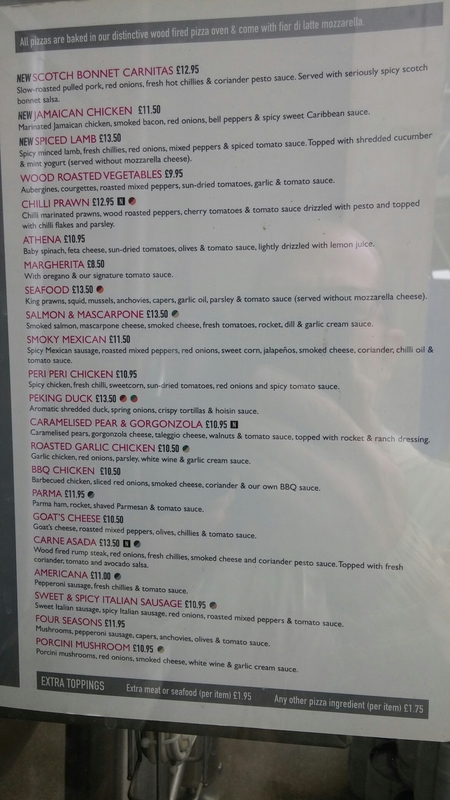 with prices ranging from £8.50 (Margherita) to a pretty pricey £13.50 (Peking duck, carne asado and quite a few others). Whilst both had a decent crisp rim, due to the thinness of the base and the overall large size, the centre was a bit soggy. They were like a New York style pizza, with the ability to flip a slice in on itself. On the Americana (my choice), they had been a bit mean with the pepperoni and there was a distinct lack of cheese. I like a nice amount of gooey, stringy cheese and lots of pepperoni on my pepperoni pizza and this was lacking on both counts – bit stingy I thought. OK and filling, but not much more. The Parma was much more generous topping wise, but there was too much rocket (I don’t get the obsession for loading up pizzas with masses of rocket personally – put it in a properly dressed side salad if you must). Also I would have preferred the Parma ham to have been torn up and scattered over the base rather than applied as whole slices straight from the packet. Personally I am also not that keen on pizzas without melted cheese and this one certainly lacked a decent enough marinara sauce to pull it off. Not sure if the lack of melted cheese was by design or just an error. We assumed the former, but on looking at the menu again it could well have been the latter. With the BOGOF, the Americana as the cheaper of the two was free so the two pizzas we ordered came to £11.95. Wine wise Italian wines dominate, but the list has one or two bottles of more unusual stuff on it (a Uruguayan white for instance – with the place more known for its Tannant based reds – and a pinot grigio riesling blend from Brazil) and at least one glaring geographical error (Conde Villar Vinho Verde is most certainly not from Italy – Portugal is where it is from chaps). 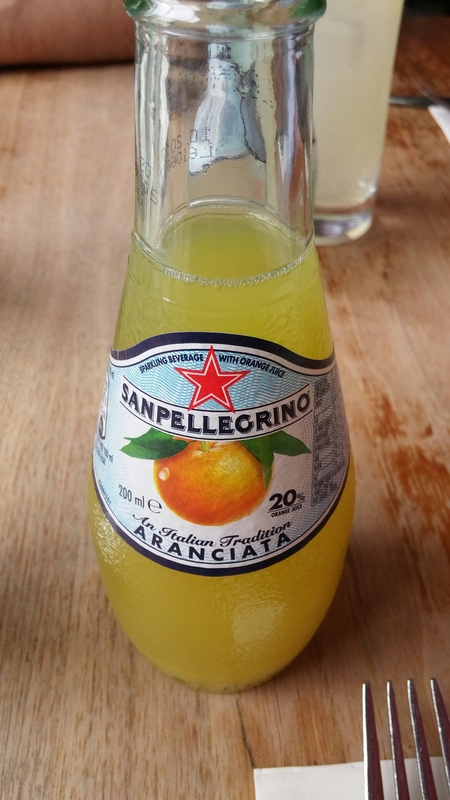 We were on the soft drinks as it was a school day lunch and ordered San Pellegrino all round for what seemed a bit of a steep price at £2.75 (even assuming it was a 330 ml can). What arrived was a dinky 200ml bottle. This equates to a quite astonishing £7.81 a pint – a price considerably higher than any of their beers. I know I bang on about wine mark ups, but this is a whole new level of outrageous when a 200ml bottle of this stuff retails in Tescos at 66p. Bearing in mind this would have been bought wholesale for a fair bit less, that is one hell of a mark up. Totally unacceptable to penalize non drinkers/designated drivers like this in my humble opinion. The food was OK. Large portions that will mean you won’t leave hungry, but not that cheap and not that inspiring flavour wise based on what we had. Competition in the pizza market is pretty stiff in the City centre and if truth be told there are better pizzas to be had in the town centre in places like Cafe Citta, The Real Italian Pizza Company, Locke & Remedy and Base + Barley. The latter three are running week day offers (50% off on Mondays at Base + Barley and 2-4-1 Monday to Thursday at Locke & Remedy and 2-4-1 Monday to Friday at The Real Italian Pizza Company) which make them better value than Zero Degrees even with their BOGOF offer. I don’t like automatically added “optional” service charges at the best of times and I seriously don’t like ones that are applied (like this) to the notional (non discounted) amount rather than actual bill amount. Personally I think this is a bit naughty and on canvassing the opinion of people in work they were of a like mind. Would I go back? For a beer yes, but as for food probably not and certainly not for a soft drink. Better quality and value is to be found elsewhere in town to my mind. They also have branches in Bristol, Reading and Blackheath, London. 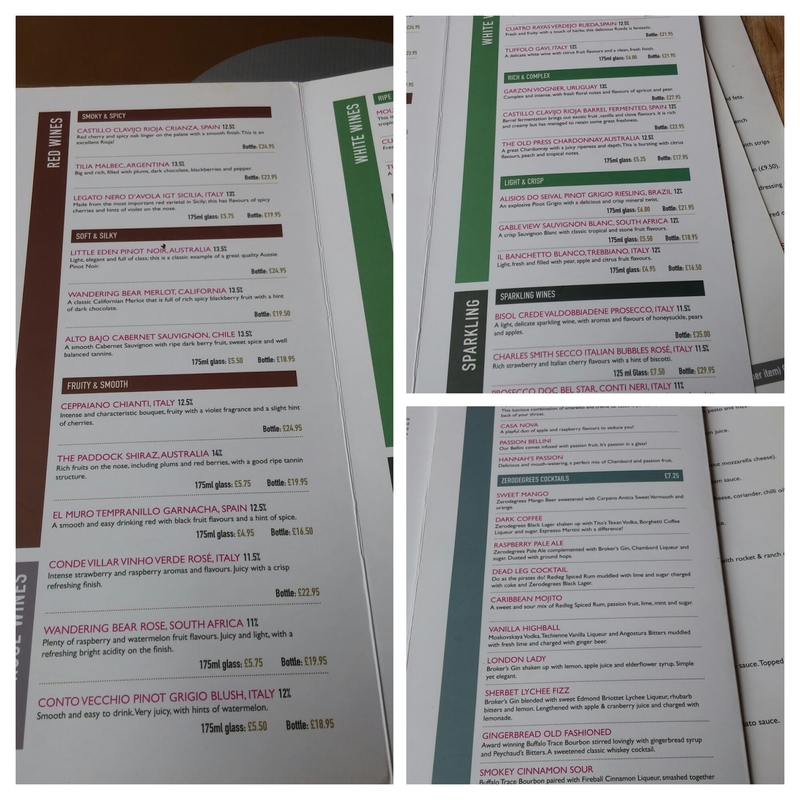 This entry was posted on Jul 17, 2016 by solicitingflavours in Base + Barley, Beer, bitter, Cafe Citta, Cardiff, Cardiff restaurant, cheese, craft beer, discount menu, Drink, Dry white wine, Food, Food and wine products, italian, Italian wine, Italy, lunch, lunchtime, Non alcoholic drink, pizza, Portugal, Portuguese wine, Real Italian Pizza Company, Red Wine, Restaurant Review, review, Zero Degrees.